The Minotaur is a hostile mob that spawns within a Labyrinth found in the Twilight Forest. Unlike the Maze Slime, which spawns naturally within the Labyrinth, the Minotaur can only spawn from a Minotaur Spawner located within one of the various treasure-holding rooms in the Labyrinth. The Minotaur appears to be a reskinned player mesh that has had a slightly reskinned cow head mesh with added horns to replace the head. The Minotaur is a fairly formidable foe, especially to unarmored players and players with low-level equipment, as the Minotaur can kill an unarmored player in three hits (and will do so quite rapidly, attacking in quick succession) and will take more than one hit from a Nano Saber or a non-critical-hitting Vajra to be taken down. The Minotaur wields a Golden Axe and deals 2.5 hearts of damage (5 units of health) with each hit that it deals to the player. It is also possible for a Minotaur to use its charge attack. The charge attack is similar to that of the Minoshroom, except no extra damage is dealt. The Minotaur sprints in place for two seconds, then charges at full speed towards the player, gaining a large amount of ground over the player in a very short amount of time. The Minotaur can also spawn in large groups, which can quickly overwhelm an unprepared player. As the walls of a Labyrinth are difficult to dig through, possible tactics include using the minimal higher ground that is available and walling oneself off and attacking the Minotaurs in this manner. All in all, if the player expects to be fighting any Minotaurs, it is advisable to bring blocks to build with and possibly a high-tier pickaxe to deal with Mazestone. When a Minotaur dies, it drops Raw Meef or Meef Steak if killed while on fire. The Minotaur can also drop its Golden Axe very rarely, which will have some durability damage and (even more rarely) an enchantment. Currently, the specifications for possible enchantments on these axes are unknown. Minotaurs are intended to guard treasure rooms, which can contain Steeleaf, Steeleaf Armor, Ironwood, Ironwood Armor, and one or more Maze Map Focus. 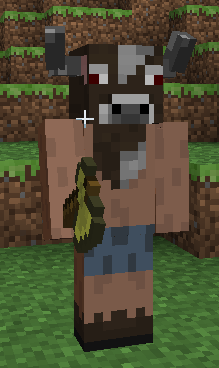 A Minotaur's axe can be enchanted as Bows dropped by Skeletons and weapons dropped by Zombies and Zombie Pigmen can and will appear as such in a Minotaur's hand if it is.